A quaint quail and quince quiche was served to the Queen. Quack is the noise a duck makes. 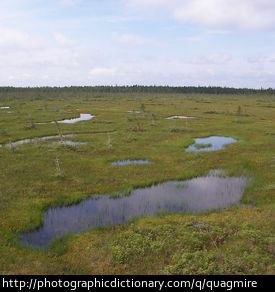 A quagmire is another word for bog or swamp, a soft area of land that may be muddy or covered in a small amount of water. 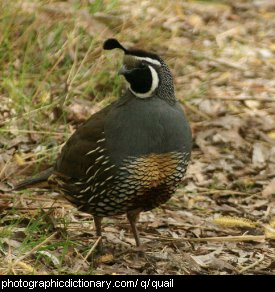 A quail is a small bird that lives on the ground. There are many different types of quail, and they are in the same family of birds as the pheasant. 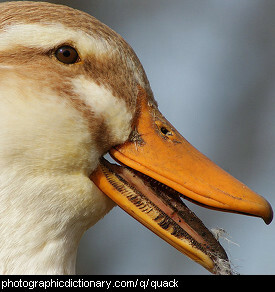 They eat mostly seeds but will also eat insects. Quails build their nests on the ground. 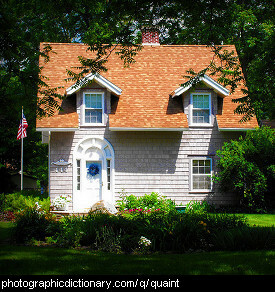 Something is quaint when it has a certain old-fashioned charm, or if it is interesting in a nice way but a little strange too. 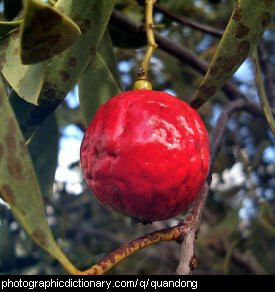 Quandongs are a type of fruit found in Australia, and are also known as the native peach. 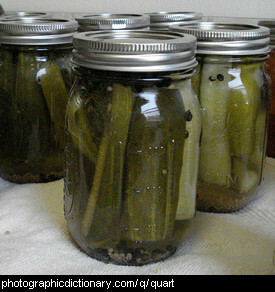 They are semi-parasitic and will get some nutrients from the roots of nearby trees and plants. Quandongs grow right across Australia, even in the dryest areas. The fruit itself had a big seed and a very thin coating of fruit on the outside. The seeds are textured and can be made into interesting jewelry. Quandongs can be used to make jam and pies. 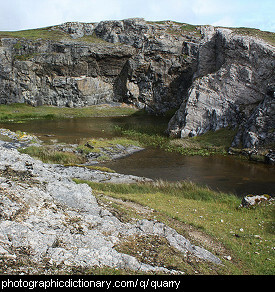 A quarry is a large hole in the ground where rock is cut from to use for other purposes. Stone for making buildings from was taken from quarries before bricks were in widespread use. A quart measures liquid. It is one quarter of a gallon, or 0.946 liters in the U.S. 1.136 liters in Great Britain. 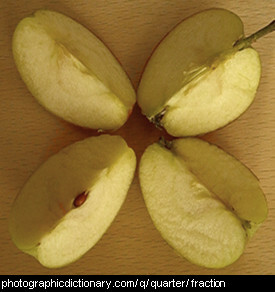 This apple has been cut into quarters. This means it has been cut into four equal sized pieces. 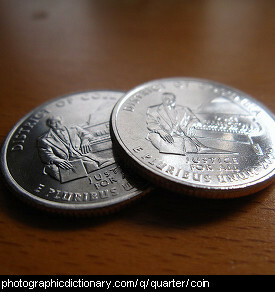 A quarter is an American or Canadian coin that is worth a quarter dollar, or twenty five cents. 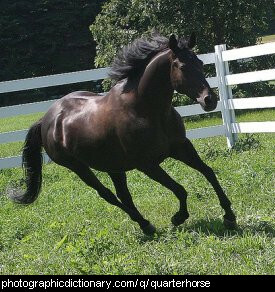 The American Quarterhorse is a breed of horse that is very fast over very short distances, hence the name - coming from a quarter mile race. They are also used at rodeos and as working horses.